As has been demonstrated with previous Newbuild features, the modern-day scene of Marine Engineering has spawned a myriad of specialist vessels. Likewise, companies dedicated to marine engineering activities such as dredging have evolved and expanded with the changing needs of the industry to also specialise in other forms of subsea operation. One such business is the Dutch company of Van Oord, which can trace its roots back to 1868 when it was founded by Govert van Oord. The origins of Dutch marine engineering lie in the Netherlands’ unique location on the North Sea and its battle against the water. The history of Van Oord is entwined with the country’s biggest marine engineering works, including the Nieuwe Waterweg Canal, the Delta Works, and the Port of Rotterdam Maasvlakte II expansion. These were projects that fuelled economic growth and kept the population safe from flooding. The company has grown into an international marine contractor specialising in dredging, oil and gas infrastructure and offshore wind services. A succession of acquisitions and mergers has helped with this growth. 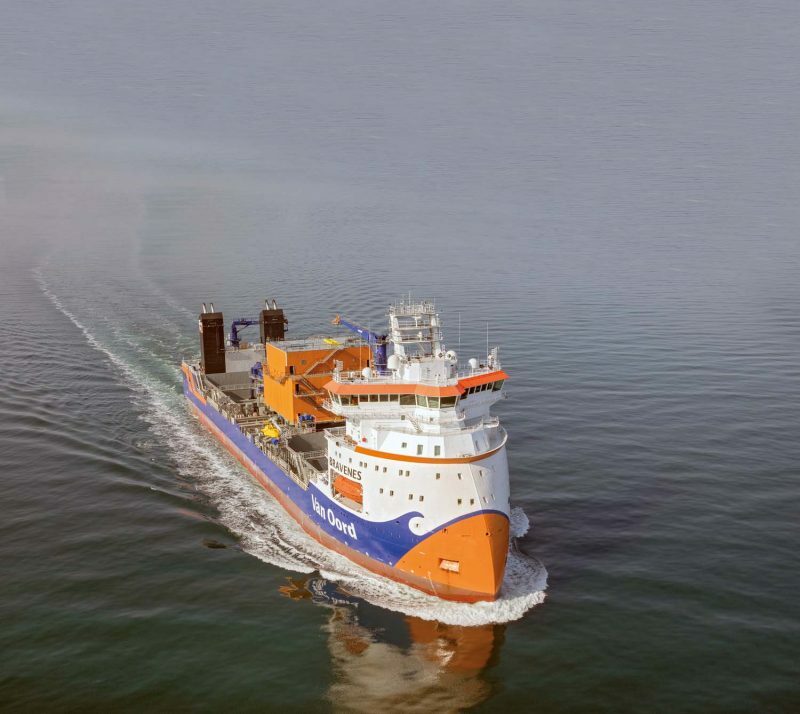 By 2010 activities in dredging, offshore and wind energy dictated the need for an increase in custom-built vessels such as the 19,848gt/2013 built offshore installation vessel Aeolus, the 6,000gt/2015 built cable-laying vessel Nexus and the 9,547gt/2013 built Cutter Suction Dredger Artemis. Van Oord celebrated its 150th Anniversary in 2018 via a two-day event at the company’s home town of Werkendam. This event also featured the naming ceremony on 14th April of the new 768gt/68m long and 11m beam crane/hopper vessel Werkendam, Van Oord’s first LNG powered vessel. The naming ceremony was carried out by Pia Van Oord, the wife of Govert van Oord, who is the grandson of company founder Govert van Oord. The celebrations also included the unveiling on 14th April of a bronze statue of a local worker (“Griendwerker,” created by artist Jaap Hartman) on the Sasdijk dyke in Werkendam. Van Oord’s turnover in 2017 was €1.5 billion with a profit of €78 million. The fleet at that time included 22 Trailing Suction Hopper Dredgers, 11 Cutter Suction Dredgers, 12 Water Injection Dredgers, 2 Offshore Installation Vessels and 3 Flexible Fall Pipe Vessels.